[NEW] Sony PS4 - DualShock 4 Wireless Controller for PlayStation 4 - Crystal !!! PS4 Controller PlayStation DualShock F.C. Football Club - Limited Edition - NEW! Product Line DualShock 4. Physical Characteristics Color Jet Black. Technical Information Connectivity Technology Wireless. Wireless Technology Bluetooth. Manufacturer Sony. Platform Supported PlayStation 4. Trending at $22.26eBay determines this price through a machine learned model of the product's sale prices within the last 90 days. Interface Type: Bluetooth. Compatible: PlayStation 4 / PC. 3.5mm audio jack for practical and personal audio solution. 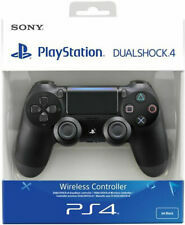 Brand New Dualshock Wireless Controller for Sony Playstation 4 - BERRY BLUE. Open box item. No retail packaging. Tested and works great!! Brand new! USB Not included. Controller only. No retail packaging! Brand new condition! Free shipping!! 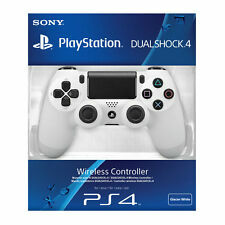 4 out of 5 stars - Brand New Dualshock Wireless Controller for Sony playstation 4 Berry BLUE. New!! 16 product ratings16 product ratings - Brand New Dualshock Wireless Controller for Sony playstation 4 Berry BLUE. New!! Trending at $49.49eBay determines this price through a machine learned model of the product's sale prices within the last 90 days. 5 out of 5 stars - Sony DualShock 4 - Playstation 4 Wireless Controller - Multiple Colors! 53 product ratings53 product ratings - Sony DualShock 4 - Playstation 4 Wireless Controller - Multiple Colors! Its definitive analog sticks and trigger buttons have been improved for greater feel and sensitivity. The addition of the Share button makes utilizing the social capabilities of the PlayStation 4 as easy as the push of a button. FREE SHIPPING!!! 30 DAY RETURNS!!! 100% SATISFACTION!!! ♕ Refined Analog Sticks: Improved analog sticks and trigger buttons allow for unparalleled accuracy with every move. New ListingSony Playstation 4 DualShock 4 Controller New! Black! 5 out of 5 stars - Sony Playstation 4 DualShock 4 Controller New! Black! 626 product ratings626 product ratings - Sony Playstation 4 DualShock 4 Controller New! Black! 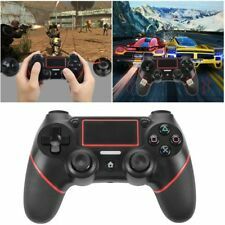 PS4 PS3 Controller 3-in-1 Wired Gaming Controller Dualshock 4 Gamepad with Vibration Turbo and Trigger Buttons Portable Gaming Joypad for Playstation 4 Playstation 3 Windows TV Box Android Feature: 【Wide Compatibility】This 3 in 1 Wired Game Controller works with PS4, PS3, Windows, Vista, TV box and Android(version 4.0 or above, the device must fully support OTG function). Different led color in different modes, ps4 white, ps3 red, PC blue, android mode green. Xbox 360/ Xbox One/ IOS is not supported..
Its definitive analog sticks and trigger buttons have been improved for greater feel and sensitivity. The addition of the SHARE button makes utilizing the social capabilities of the PlayStation system as easy as the push of a button. Features:With long cable and support vibration-feedback (functionality may vary for PC and for Mac)High compatibity for PS4, PC, and for Mac via USBTouchpad and motion sensing technology. (functionality may vary for PC and for Mac)Plug and play,easy to use it.You can enjoy the perfect game by this device.Precise Control: The feel, shape, and sensitivity of this controller's analog sticks and trigger buttons have been enhanced to offer players absolute control for PS4.Sharing at your Fingertips: The addition of the Share button makes sharing your greatest gaming moments as easy as a push of a button.Upload gameplay videos and screenshots directly from your system or live-stream your gameplay, all without disturbing the game in prog. Interface: Bluetooth wireless. Full Function Edition (with Touch Audio External Play Double Vibration Lamp). Built-in Battery and other original components, it has good durability and good quality. The DUALSHOCK®4 USB wireless adaptor makes Remote Play on your computer even better, allowing you to play wirelessly. KEY FEATURES. Built-in Speaker and Stereo Headset Jack. Interface: Bluetooth wireless. Full Function Edition (with Touch Audio External Play Double Vibration Lamp). Nothing would be the trouble. Most problem would be solved well on the base of friendly communicate. Prop 65 Warning WARNING: This product can expose you to chemicals including Styrene, which is known to the State of California to cause cancer, birth defects, and reproductive harm. 100% Official. Brand new. Box may have slight shelf ware on it. NOTE: Please noticed this is a Wired controller. The wired controllers don't have the headphone jack,and it doesn't have a built-in battery,just need to connect the USB cable to the host and wait for one mintue to use it. It is a third-party product.It is not a Sony brand.And the actual effect is the similar as the original one. Package Includes: •1 x Wired Controller for PS 4 •1 X USB CABLE. Brand New For Playstation 4 PS4 Wireless Controller BLACK with CABLE CHARGER! Condition is New. I have opened up one to take pictures but you will not receive the opened one! For sale is a black dualshock 4 controller for playstation 4! I opened it, played with it twice, and decided I didn't want a third controller. Therefore, the condition is basically brand new. I even have kept the box and everything! Any questions, let me know! Happy bidding! Interface: Bluetooth wireless. Full Function Edition (with Touch Audio External Play Double Vibration Lamp). Built-in speaker and stereo headphone jack. Nothing would be the trouble. Most problem would be solved well on the base of friendly communicate. Scuf Impact Controller PS4. Condition is Used. Shipped with USPS First Class Package. Comes with original box and accessories. Everything is in perfect working condition. Interface: Bluetooth wireless. Connection: Bluetooth. Support air upgrade, 600 MAH new lithium battery, stable quality, support while playing while charging.Wireless Handle: With Bluetooth, Vibration.